Today Rocky Mountain Institute released The Economics of Load Defection, a new report that analyzes how grid-connected solar-plus-battery systems will become cost competitive with traditional retail electric service; why it matters to financiers, regulators, utilities, and other electricity system stakeholders; and possible paths forward for the evolution of the electricity grid. A little over a year ago (February 2014), RMI published The Economics of Grid Defection detailing when and where off-grid solar-plus-battery systems would compete with traditional electric service. It was the first comprehensive and publicly available analysis on the subject, and in the months that followed, a number of financial institutions—including Barclays, Citigroup, Morgan Stanley, and Goldman Sachs, among others—came to similar conclusions. In the face of declining costs for solar PV and batteries, current utility business models will face serious challenges. By early this year, Greentech Media identified “grid defection” as one of the top industry buzzwords of the year 2014. In fact, the topic surfaced yet again just last week in a widely circulated Washington Post article. But we said then and we’ll say again now: just because grid defection may become an economic option doesn’t mean customers will actually choose to cut the cord with their utility, and there are plenty of reasons why doing so would be a suboptimal outcome. 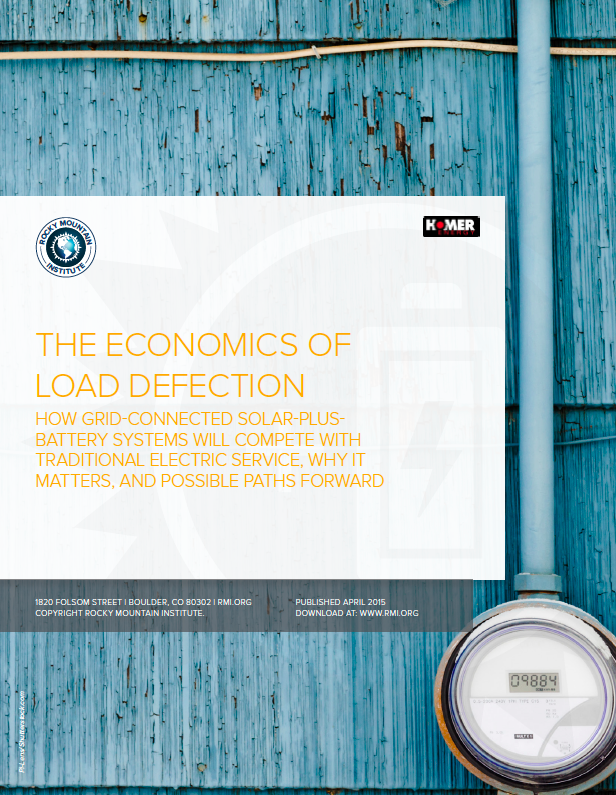 So in The Economics of Load Defection we focused our analysis on a much more likely scenario that could represent an even greater challenge: customer economics for grid-connected solar-plus-battery systems. Since such systems would benefit from grid resources, they could be more optimally sized, thus making them smaller, less expensive, economic for more customers sooner in more places, and adopted faster. Solar-plus-battery systems rapidly become cost effective. 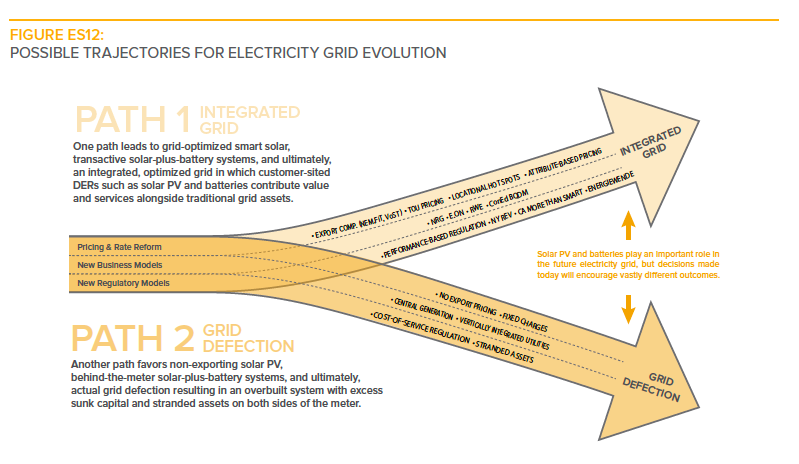 The economically optimal system configuration from the customer’s perspective evolves over time, from grid only in the near term, to grid-plus-solar, to grid-plus-solar-plus-batteries in the longer term. New customers will find solar-plus-battery systems most economic in three of our five geographies within the next 10–15 years. Solar PV supplants the grid, supplying the majority of customers’ electricity. Over time, as retail electricity prices from the grid increase and solar and battery costs decrease, customers logically reduce their grid purchases until the grid takes a backup-only role. Meanwhile, solar-plus-battery systems eventually provide the majority of customers’ electricity. Potentially large kWh defection could undermine revenue for grid investment under current rate structure and business models. Our analysis shows that grid-connected solar-plus-battery systems become economic for large numbers of customers, and those systems have the potential to supply greater and greater portions of customer’s electricity. Assuming customer adoption follows optimal economics, the magnitude of load defection from the grid is large. net grid purchases) and that abolishing net metering will preserve grid load. Our findings suggest that eliminating net metering merely delays significant utility load erosion. However, fixed charges—which some utilities have recently proposed—don’t ‘fix’ the problem. As with NEM, residential fixed charges would likely alter (i.e., delay) the economics for grid-connected solar and solar-plus- battery systems, but likely wouldn’t alter the ultimate load defection outcome. Fixed charges would only represent a short-term ‘fix’—in the long run, this will make more drastic choices, such as complete defection, relatively more attractive. Peak price for individual customers. Investing in their lowest-cost option for electric service through grid-connected solar and solar- plus-battery systems can effectively cap customers’ electricity costs. No matter how expensive retail electricity prices get in the future, the levelized cost for grid-connected solar and solar-plus-battery systems keeps customers’ bills at or below a ‘peak price,’ in some cases yielding a significant savings on their monthly utility bill. While potential implications for utilities, third-party solar and battery providers, financiers/investors, and other electricity system stakeholders are profound, customer adoption of these systems also presents a number of opportunities. The grid-connected customers of this analysis crucially do maintain their grid connection, assuming that potential fixed charges and other changes to retail electricity rate structures don’t become so onerous as to encourage customer grid defection. This means that although they could represent significant load loss, customers’ grid-connected solar-plus-battery systems can potentially provide benefits, services, and values back to the grid, especially if those value flows are monetized with new rate structures, business models, and regulatory frameworks. For distribution grid operators (such as wires-only utilities), customers with solar and battery systems should be able to provide value to the grid through upgrade deferrals, congestion relief, and ancillary services. However, new pricing, regulatory, and business models need to emerge and mature to capitalize fully on these opportunities. For owners and operators of central generation and transmission (such as independent power producers and merchant power plants), our analysis suggests that solar-plus-battery systems will accelerate the decline of sales from central generation, reduce peak price spikes in deregulated markets, and encroach on markets for ancillary services. There is also a risk of stranded assets: existing assets still within their economic life and cost recovery period will serve a smaller and smaller remaining load, requiring price increases to cover costs and returns. For vertically-integrated utilities, these systems will strain current business models, and adjustments will be necessary to fully capitalize on the rising adoption of solar PV and batteries. Distribution utilities whose revenue depends on volumetric sales of electricity (e.g., that are not decoupled) will likely face similar challenges. The electricity system is at a metaphorical fork in the road. Down one path are pricing structures, business models, and regulatory environments that do not provide customers with proper incentives to invest in a way that can work with the electricity system as a whole. This can be a self-reinforcing path: distributed investments that favor individual customers and reduce their grid dependence can increase overall costs for remaining grid-dependent customers, making solar-plus-batteries more attractive still. Ultimately, we worry that this path could lead to resistance to these technologies from established industry participants, and make the economics for complete defection more compelling for customers. Alternatively, pricing structures, business models, and regulatory environments implemented today or in the near future that appropriately values the grid benefits of solar and solar-plus-battery technologies as part of an integrated grid can lead the system down another path. Solar PV and batteries, with the proper incentives, can potentially lower system-wide costs while contributing to the foundation of a reliable, resilient, affordable, low-carbon grid. These two pathways are not set in stone, and there is some room to navigate within their boundaries. But decisions made today will set us on a trajectory from which it will be more difficult to course correct in the future. We firmly believe that early and proactive action that appropriately values solar-plus-battery systems (and other distributed energy resources) and allows them to contribute to grid services will lead to a lower-cost, cleaner, and more-reliable electricity system.